Last night, thanks to a generous birthday present from a friend, we had the chance to experience the Ryman Auditorium for the first time – the mother church of music here in Nashville. It was a lot of fun walking around and seeing all the posters of past performers and seeing the history of that place. 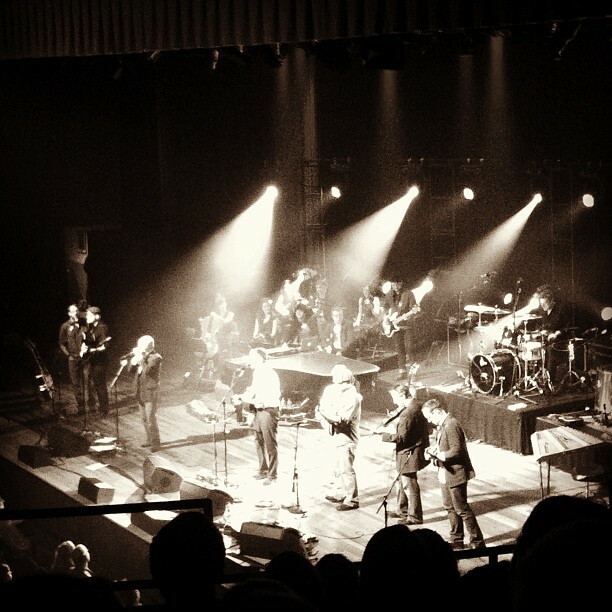 The show was Andrew Peterson’s Behold the Lamb of God, his annual advent concert. It was an amazing night of talented musicians sharing their gifts as they tell the story of the coming of Christ. It was a great night, full of expectation of the coming of Jesus into a dark and broken world. I sat there experiencing a quiet, content joy at what was being sung, what was being expressed with hope, and I was reminded of how important these moments are in our preparation for Christmas. This expression of singing, of writing songs, is linked to joy through scripture. “Sing for joy, for great is the Holy One among you”. Worship. Sing. Praise. Joy is found in these moments, and this concert was such a deep reminder that joy comes from response, from recognizing that the Lord is our strength, our defense, our salvation, and that should move us to a place of joy. Today and this week, may there be opportunities for you to sing, to praise, to rejoice in your own way, to find joy in a creator who has done glorious things, and will do glorious things. And then take that into a world so desperate for a glimpse of where joy happens. May we make it known among the nations. Amen.